Interneuron development is intimately linked to their ultimate function. For instance, in examining genes critical for the development of specific interneuron subtypes, such as Sox6 and Satb1 that are required for the development of PV- and SST-expressing interneurons (Batista et al., 2009; Close et al., 2012), we have been able to demonstrate how perturbation of the developmental programs utilized by specific interneuron populations can result in diseases, such as epilepsy. To further explore the role of interneurons in cortical computation, the Fishell laboratory in collaboration with the Tsien and Rudy Laboratories, have begun to examine the function of some of the interneuron cohorts we have been able to genetically target. One of these collaborations has recently resulted in a publication examining the somatosensory cortex, where we were able to demonstrate that sensory-motor gating is partly achieved by the activation of VIP interneurons during active whisking, which in turn function to disinhibit the SST-expressing population (Lee et al., 2013). Furthermore, insight into how the activity of specific interneurons may relate to disease has come from our study of the development and function of the presynaptic Cntnap4 protein (Karayannis et al., 2014). 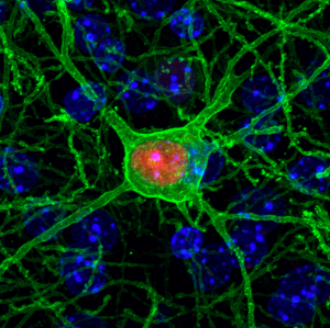 Cntnap4 expression in PV-expressing interneurons mirrors their maturation. Specifically, the development of the strong reliable input that PV-expressing basket cells provide pyramidal neurons is reflected by the upregulation of Cntnap4 in this population. Moreover, mice lacking Cntnap4 display both stereotype repetitive overgrooming behaviors and a motor-sensory gating endophenotype defects resembling those seen in human ASD patients. Given the homology between Cntnap4 and Cntnap2 and the latters known association with ASD, we explored whether Cntnap4-deficient individuals are prone to ASD and found a number of patients with either copy number variants or frank loss of Cntnap4 gene function. Another gene that has been shown to be linked to ASD is oxytocin. In a recent collaboration with the Tsien laboratory (Owen et al., 2013), we have been able to reveal a novel mechanism by which oxytocin is able to increase signal to noise in hippocampal circuits, providing a possible mechanism for the link between disruption of oxytocin-signaling and ASD, as well as providing a possible avenue for therapy. Finally, a new direction of the laboratory involves the systematic search for drugs that can enhance the function of specific interneuron populations, which we believe will provide an avenue by which such disorders can be treated. Batista-Brito R, Rossignol E, Hjerling-Leffler J, Denaxa M, Wegner M, Lefebvre V, Pachnis V, Fishell G. The cell-intrinsic requirement of Sox6 for cortical interneuron development. Neuron 2009 Aug 27;63(4):466-81. Close J, Xu H, De Marco García N, Batista-Brito R, Rossignol E, Rudy B, Fishell G. Satb1 is an activity-modulated transcription factor required for the terminal differentiation and connectivity of medial ganglionic eminence-derived cortical interneurons. J Neurosci. 2012 Dec 5;32(49):17690-705. Owen SF, Tuncdemir SN, Bader PL, Tirko NN, Fishell G, Tsien RW. Oxytocin enhances hippocampal spike transmission by modulating fast-spiking interneurons. Nature. 2013 Aug 22;500(7463):458-62. Epub 2013 Aug 4. Lee S, Kruglikov I, Huang ZJ, Fishell G, Rudy B. A disinhibitory circuit mediates motor integration in the somatosensory cortex. Nat Neurosci. 2013 Nov;16(11):1662-70. Epub 2013 Oct 6. Karayannis T, Au E, Patel JC, Kruglikov I, Markx S, Delorme R, Héron D, Salomon D, Glessner J, Restituito S, Gordon A, Rodriguez-Murillo L, Roy NC, Gogos JA, Rudy B, Rice ME, Karayiorgou M, Hakonarson H, Keren B, Huguet G, Bourgeron T, Hoeffer C, Tsien RW, Peles E, Fishell G. Cntnap4 differentially contributes to GABAergic and dopaminergic synaptic transmission. Nature. 2014 Jul 10;511(7508):236-40.